J.P. Morgan tells clients to expect Disney+ to eventually draw 160 million subscribers from around the world, more than Netflix's current 139 million. Disney announced the new service in November after telling shareholders it will pull all its movies from Netflix in 2019. 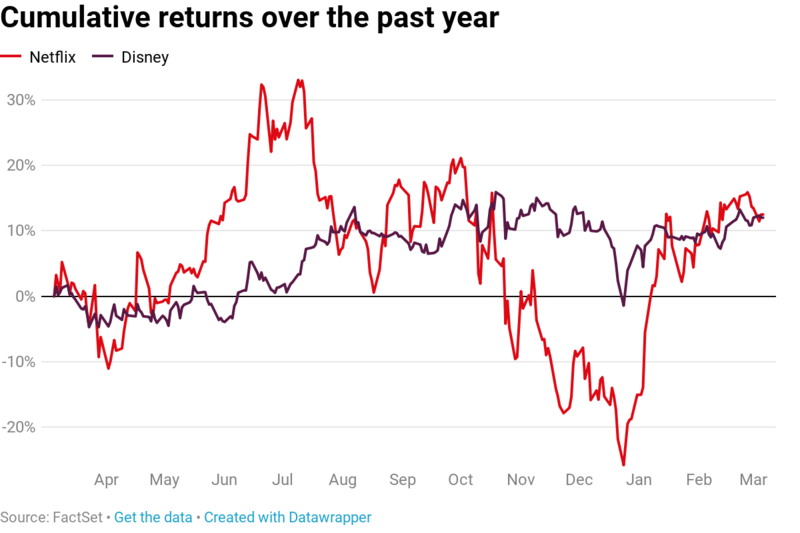 "While there is little question there are more direct-to-consumer services today than ultimately should survive, we have no doubt that Disney+ remains on the short list," analyst Alexia Quadrani writes. Disney's global popularity and vast content library spell increased competition for subscribers at rival streaming platforms like Netflix, according to J.P. Morgan. With the company set to launch Disney+ late this year, analyst Alexia Quadrani told clients to expect the service to eventually draw 160 million subscribers from around the world, more than Netflix's current 139 million. "While there is little question there are more direct-to-consumer services today than ultimately should survive, we have no doubt that Disney+ remains on the short list of products that should prevail longer-term," the analyst wrote in a note. "Our confidence in the resilient success of Disney+ comes from the company's unmatched brand recognition, extensive premium content, and unparalleled ecosystem to market the service." Disney announced the service in November after telling shareholders it will pull all its movies from Netflix in 2019, and start its own streaming offering for its past titles. The hotly anticipated platform will feature new, original shows and movies, including original Marvel and "Star Wars" series. It will also include content from Disney's computer animation film studio Pixar. Disney's foray into the streaming world has sparked interest across Wall Street as Netflix, Amazon, Hulu and others compete for subscribers with exclusive content and price warfare. While some have drilled down on big content spending and higher subscription fees, others have sought to offer more modest alternatives. Hulu, for example, cut the price of its most popular plan last month while Netflix recently announced a price hike, bumping its cheapest plan to $9 per month. Hulu's new prices, though apparently not a ploy to raise capital, could lock in customers ahead of key streaming launches from media giants. Disney's service will be more modest in terms of price and amount of content compared to Netflix, Quadrani added, though the key determinants of its success will likely be the quality of its movies and shows. "Disney has already shown some disposition to forego short-term revenues in order to develop the streaming business, by pulling content from Netflix once its contract expires at the end of the calendar 2018 film slate," Quadrani said. "While Disney management has not yet commented on a specific price, the company has stated that Disney+ will be 'substantially below' the price of Netflix." To be sure, it could take a number of years for Disney to ramp the new service across the globe, and questions remain over when existing content rights will revert to Disney in a handful of major geographies. But even in the U.S., where Quadrani sees about 45 million subscribers in the long run, J.P. Morgan is "confident that there is a substantial market for Disney+." The Walt Disney Company's stock rose 0.3 percent Wednesday following the J.P. Morgan note. The media giant's stock is up more than 8 percent over the past 12 months, ahead of the S&P 500's gain of 2.2 percent.